Imagine Mike Mearls has given you the job of coming up with the #dndnext cosmology. What would you keep from prior editions and what would you bin? Soon after agreeing to organise the carnival I realised I’d have to actually write something myself for it! This is my post. 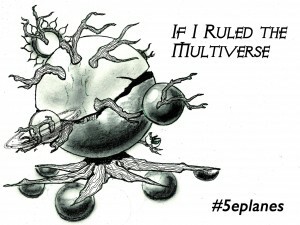 The main aim of my benevolent dictatorship as Supreme Ruler Of The Entire Multiverse is to keep the things I like about the current D&D cosmology, while reintroducing the Great Wheel (well, sort of) and bringing back some of the fun stuff from Planescape that disappeared in 4e. So, working backwards from the current 4e planar setup, what would I keep? First of all, I really like the Gods vs Primordials world creation myth that appears in the 4e Dungeon Master’s Guide and Essentials DM’s Kit. I’m going to be keeping the Elemental Chaos and the Astral Sea (more on this in a minute) so the creation story makes sense and can remain pretty much as is. I also want to keep the Feywild and the Shadowfell as light and dark reflections of the material plane, so it’s fine to have the primordials throw the bits of the world that were too bright and too dark away to become these two planes. My Shadowfell includes Barovia, Sithicus, Darkon and the other Domains of Dread from Ravenloft, the atmospheric city of Gloomwrought, Moil (the City That Waits), the Raven Queen and plenty of undead. If the_monkey_king would let me, I’d like to add the Courts of the Shadow Fey here too. The Feywild is unchanged as the home to the eladrin and the Court of Stars, with the fomorians skulking beneath the surface in their dank caverns. We’ll come back to Sigil though – there is no way the coolest city in the multiverse is floating about in the middle of nowhere in my cosmology! It belongs in one place, and one place only. If I really wanted to go back to the old skool planar structure of AD&D and Planescape, I’d probably leave it there and get rid of the Elemental Chaos, but I’m afraid to say the original elemental planes (in fact, all of the Inner Planes for that matter!) don’t do anything for me. Instead, I’ll keep the Elemental Chaos more or less as is, but remove The Abyss – that needs to be reunited with the other Lower Planes. The slaadi and githzerai can stay here though – I don’t think we need both Limbo and a whirling elemental maelstrom as well. I’m a big fan of the City of Brass, and the other cool genie strongholds described by the_monkey_king in Secrets of the Lamp such as the Great Dismal Delve of the dao and the Citadel of Ten Thousand Pearls of the marid can all fit comfortably here too. The Elemental Chaos also serves as home for the Princes of Elemental Evil and Blibdoolpoop, but not the giants and their gods Thyrm and Surtr – I’ve somewhere else for them to go. I’m going to keep the Astral Sea as well – the githyanki ships are just too cool, and I want to keep the floating corpses of the dead gods as an unconventional adventuring location. As in 1e AD&D, colour pools will provide access to the Outer Planes, the homes of (most of) the gods, now back in a Great Wheel/Ring arrangement. The astral dominions bobbing around in the Sea are gone. My Great Wheel is a stripped down, sleeker version of the one that’s existed since the early days of D&D. There are now eight Outer Planes, one for each alignment, forming the rim of the wheel, and a ninth, its hub. I’ve ditched the in-between planes or incorporated them into neighbouring planes. Is anyone really going to miss Arcadia, Bytopia or Gehenna? I don’t think so. As in Planescape, the dark River Styx, complete with Charon the Boatman and his marraenoloths, connects the Lower Planes, and the sweet waters of River Oceanus act as a link between the Upper Planes. Mechanus (LN), clockwork home to Primus and the modrons who march around the Great Ring every 17 years. 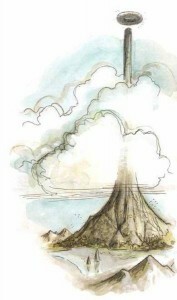 Mount Celestia (LG), the Seven Heavens, home to Bahamut and Moradin, and the archons of earlier editions (sword, hound, lantern etc). Elysium (NG), the plane of absolute goodness. I’m adding Hestavar the Bright City from 4e here, the home of Pelor, Ioun, Erathis. The main inhabitants of this plane are the guardinals although I’m ditching the dumb horsey ones (the equinals). Arborea (CG) is the forested home of the Seldarine (the elven gods, including Corellon Larethian), as well as Mount Olympus. I’m going to incorporate the Beastlands here too – partly because the wildness of the plane fits in nicely, and partly so the Greek and Elven gods have plenty of animals to hunt. Ysgard (CN) replaces Limbo. Made up of immense earth bergs flying through the sky, this plane is home to Kord, as well as the gods of the Norsemen and their enemies, Loki and the giants of Jotunheim. The Abyss (CE) is back where it should be – part of the Lower Planes. This is the home of the demons and their lords Demogorgon, Orcus, Lolth and co. I’m adding the caverns of Pandemonium here too as three of the plane’s 666 layers, incorporating the miserable (fun) city of Windglum. Zehir's jungle realm is another layer, perhaps close to tropical Abysm, Demogorgon’s realm. Gray Waste (NE). The yugoloths move back here, along with the Wasting Tower, Khin-Oin, so they can mastermind the Blood War again: the top layer, Oinos, becomes the main battleground for the conflict, as it was in the Planescape era. The fallen primordials are imprisoned in Tarterus which becomes an extra layer of this plane designed to keep these terrible beings out of harm’s way. Finally, in the centre of the Great Wheel is the Outlands (N) – a plane with gate towns leading to each of the eight surrounding Outer Planes. In the middle of the plane is a great Spire, and as a berk gets closer to it, her magic gets harder and harder to use. I’m going to bring back the rilmani here to preserve the Balance. These guys were very cool in Planescape when drawn by Tony DiTerlizzi, but for some reason in 3.x, they were depicted as lumpy-looking and naked. I’ll go with the former look, thanks. And, of course, on top of the Spire, is the doughnut-shaped Sigil, City of Doors. That’s about it. I don’t think we need an Ethereal Plane – characters can “go ethereal” to travel from one place to another or walk through walls, but they don’t visit a full blown plane to do so. I’m going to include the Far Realm obviously – why would any DM not want a Lovecraftian alien realm from which all manner of Cthulhu-inspired monsters can originate? And I’m going to include the Dreamlands (explored briefly in the 3e Manual of the Planes) in my cosmology too because it would be daft not to. So, there you have it. One mashed-up, awesome D&D cosmology! What do you think? I had a PC who was a ghoul who wrote a Zebra!